I haven’t watched the closing ceremony that occurred last night yet. I DVR’ed it. I actually got around to watching the opening ceremony just last night! Yeah, it was over two weeks’ old, but I had to, because I love seeing the flag procession showcasing all of the participating countries and their athletes. Guys, I had that flag procession playing for several hours last night, and I STILL only left off at Peru. The world is HUGE! That’s an obvious statement, but I think I enjoy this aspect of the opening ceremony so much because it reminds me of just how many different nations there are on this planet. My country is really just a speck in it all. Us Americans can admittedly tend to feel like the center of the Universe sometimes; we are definitely not. And that is a good thing! You know what else are a good thing? Peaches! Peaches in salad have been a MUST for me this summer. And of course, strawberries and a balsamic vinaigrette are no-brainers, especially in a spinach salad. And the cherry tomatoes and the basil . 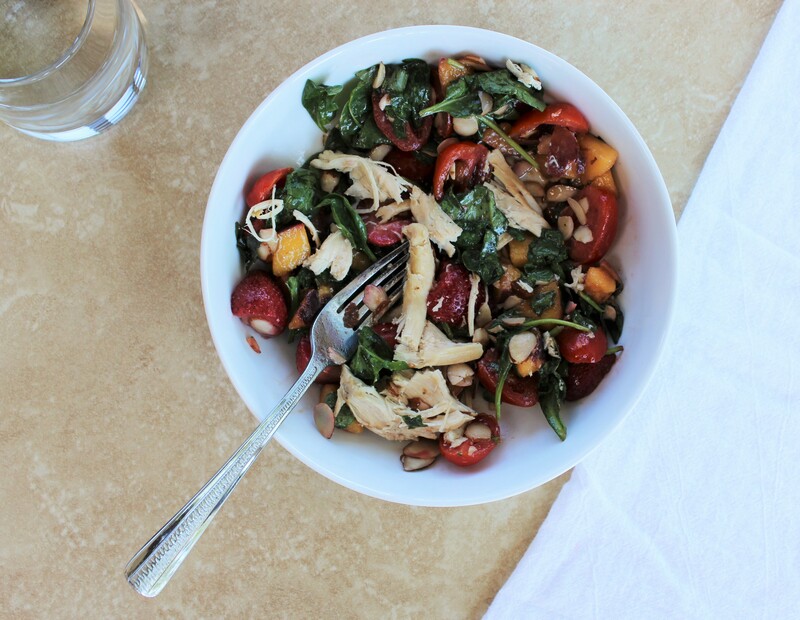 . . I’m OBSESSED with this Strawberry-Peach Balsamic Spinach Salad! I like using heartier leaves like spinach and kale in my salads because they contain less water than some of the traditional lettuces, such as iceberg. The darker greens hold up better, and they contain more of the beneficial nutrients, such as fiber and iron. Plus, I think they plain ol’ taste better. I did three drafts of this salad before settling on the current incarnation, which is topped with pulled roasted chicken. Each of the previous times I made it, I thought, “It’s good, but it’s missing something. It needs something savory.” I tried feta, but I wasn’t a huge fan of that. Chicken turned out to be the perfect addition. You could roast your own chicken (a magical experience, really – I love home-roasted chicken!) or spring for the already-roasted market bird, which I did here. Cooking from scratch is amazing and all, but giving yourself a break sometimes and choosing the easy route is OK, too. It is summer, after all! Mix all salad ingredients except chicken together in a large bowl. To a container with a lid, such as a mason jar, add the olive oil, balsamic vinegar, and black pepper; shake well. Mix as much dressing in as you’d like with the salad (a quarter to a third of the jar should do). Serve topped with roasted pulled chicken. Makes about four servings. The excess dressing should keep well in the fridge for a week or two.